Geneva, 17 June 2011. Today at around 10:50 CEST, the amount of data accumulated by LHC experiments ATLAS and CMS clicked over from 0.999 to 1 inverse femtobarn, signalling an important milestone in the experiments’ quest for new physics. The number signifies a quantity physicists call integrated luminosity, which is a measure of the total number of collisions produced. One inverse femtobarn equates to around 70 million million1 collisions, and in 2010 it was the target set for the 2011 run. That it has been achieved just three months after the first beams of 2011 is testimony to how well the LHC is running. “Last post I discussed how we reconstruct tracks in LHCb. The next logical step is to talk about how we identify what sort of particle left which track…Only given the parameters of a reconstructed track, there is no way to determine what type of particle left that track. More information is required and that is where the RICH1 and RICH2 detectors come in. At this point, the discussion starts to get very technical, so I leave you in Anna” good hands. “Today’s post is a continuation of my description of the LHCb detector. From my other post on identifying vertices using the VELO, we naturally progress to tracking charged particles. As I mentioned in my first post, the VELO along with the TT, T1, T2, and T3 stations are used to reconstruct particle tracks inside LHCb. O.K., enough to wet your whistle. For the rest, read what Anna has to say and view her graphics here. 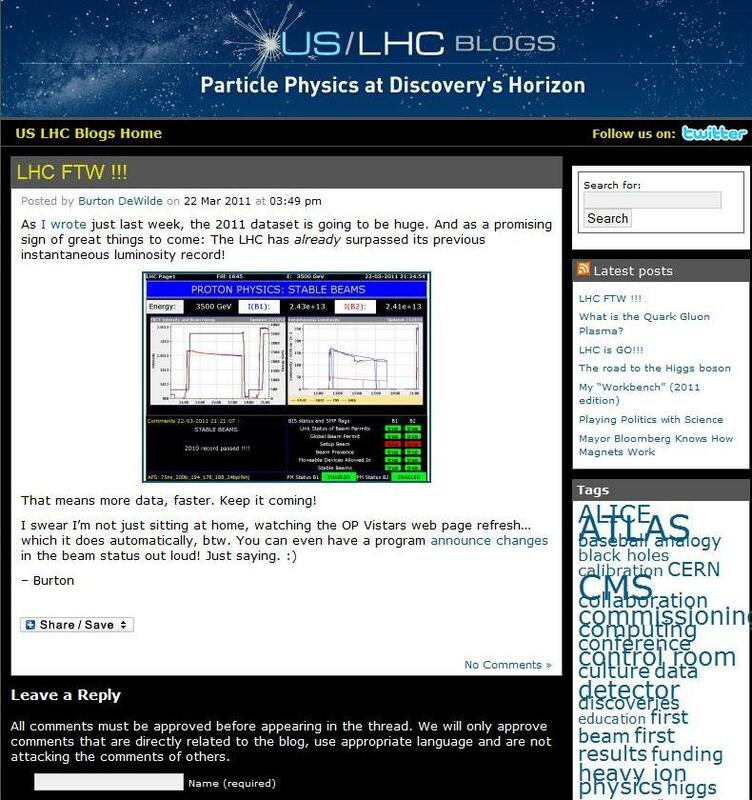 Anna is new to the US/LHC Blog. She is a delight to read. Ken [Bloom] has already discussed the luminosity record in this post, and today I’ll be discussing luminosity leveling (LUMI LEVELING). Aidan has timely discussed what luminosity is in this post where he said that larger instantaneous luminosity means having more events, we want to do everything we can to increase instantaneous luminosity. Now things get technical, so here is the link for the post. Give Anna kudos – oh, wait, now I think it is props – for another great post. I have been smitten with CERN since 1985, when I saw Tomthy Ferris’ Creation of the Universe on PBS. Not just CERN, Fermilab also, of course. But the subject of this post is the US/LHC blog at CERN, and especially the gifted scientist/writers there who try to explain what is happening. While I could no longer bring up the video at PBS, it is available from Netflix on DVD. Fortunately, I have my own copy, from VHS to DVD to mp4. It still looks good and the science still holds up. I mean, you know, it cannot be complete, but nothing there is incorrect. If anything suffers from age, it is some of the graphics. Nothing like what we see in the Brian Cox videos or in the NatGeo Inside the Milky Way. So, my subject is that hardy corps of scientists who try to explain what is happening at CERN with ATLAS, ALICE, CMS, and LHCb. Someone in this bunch told me that 30% of the scientists at CERN are from the U.S. That was part of why I started this blog, to raise the visibility of the U.S. contribution to basic scientific research world wide. This is from the old BOINC project LHC@home on which THOUSANDS OF US CRUNCHERS RAN SIMULATIONS!!. Now, we are toast. But not the cool whirligig. “I’m a postdoctoral researcher in the department of physics at Yale University. I live in France and work on the ALICE collaboration at CERN. The ALICE experiment examines nuclear collisions to explore an extreme phase of nuclear matter called “quark-gluon plasma” that is thought to resemble the universe in its earliest moments. my work with the PHENIX collaboration at Brookhaven National Laboratory. There, I honed the everyday skills of our trade: probability and statistics, programming, and communicating in a large collaboration. I arrived in nuclear physics from an unconventional path, having studied geology and environmental science as an undergraduate near Chicago and subsequently working in oil and gas exploration in the US Gulf Coast. There, my exposure to reservoir seismology techniques piqued an interest in wave mechanics. After switching to academics and dabbling in geophysics, then condensed matter research, I settled in to study how jets of high-momentum particles are modified by the dense nuclear matter created in collisions of gold nuclei at the Relativistic Heavy Ion Collider. In this initial flood of LHC physics data collection and analysis, life is busy. To regain sanity I escape to the outdoors whenever possible. I consider bikes to be a profound triumph of human ingenuity, and love cycling in many forms: road, mountain, cyclocross, and rolling around town. I’ll decline revealing how many bikes I own. Additionally, I love rock climbing, hiking, cooking, improving my French, snowboarding, and spending time with friends. My dreams are to someday become a good teacher, have a garden, and live near the mountains. “When you work in particle physics, as I do, you start to think that everyone in the world is a particle physicist, because you are always surrounded by them. This is of course not true; there are only a few thousand particle physicists in this world of six billion people—we are truly one in a million! Thus, I am sometimes surprised to find myself in this business, but here I am. How did that happen? Like so much of life, it turns on small things. I met my first physics teacher when I was in fourth grade. My school district, in South Orange, NJ, had started up a program for so-called gifted and talented elementary-school students, and recruited one of the high-school physics teachers to teach math and science for a year. All of us kids ended up melting ice and boiling water and measuring heat capacities and the like. In high school, I found physics to be the most challenging science course, and that got me interested; I was captain of the physics team. I arrived at the University of Chicago with a plan to be a physics major. The same was true for about half of the incoming class; not everyone ended up that way. I did enjoy the courses, but a major element of my college education was my research work. Largely by accident—I signed on with the instructor of my intro physics course—I found myself working in experimental particle physics, on Fermilab’s CDF experiment. The lab is only about an hour’s drive away from the U of C campus in Hyde Park, so I soon found myself regularly commuting for presentations and discussions with collaborators. And I have been in particle physics ever since. I genuinely enjoy this work. The physics itself is quite compelling; we are getting at some basic truths about how the universe works. The experiments themselves are projects of amazing scale, and I marvel that after all that must happen correctly to detect particles and record and process data, we are able to make measurements that make sense and can critically probe theoretical predictions. And there is great fun in working with such a wide range of people from so many backgrounds and cultures. That last part can be maddening at times too, but all part of the game. I went to Cornell University for graduate school, and worked on the CLEO experiment there. I helped build a silicon detector, and measured properties of B mesons, finishing my Ph.D. in 1997. Afterwards, I returned to CDF as a postdoctoral researcher at The Johns Hopkins University and then the University of Michigan. Fermilab was getting ready for a new run of the upgraded Tevatron, and there many additions and improvements being developed for CDF. I helped build the online charged-particle track trigger, worked on offline tracking software, and then led the team that developed the experiment’s muon reconstruction software. Once the data started rolling in, I worked in top-quark physics, leading one of CDF’s analysis groups on the topic and contributing to several measurements of top-quark production and properties. I joined the University of Nebraska-Lincoln as an assistant professor in 2004, and was promoted to associate professor in 2009. Since there was an existing DØ group here, I switched over from CDF to DØ. But I also started working on the CMS experiment at the LHC. Nebraska has the honor of hosting a Tier-2 computing center for CMS, one of only seven in the US; we are responsible for providing resources for data analysis and simulation production. In 2005, I was appointed as the US CMS Tier-2 project manager, overseeing the development and operation of all the US sites. It is a great privilege to work with the talented staff at the seven schools, who make me look really smart every day. I also play a coordinating role for the approximately 30 world-wide CMS Tier-2 sites, trying to make sure that everyone has the information they need to succeed in delivering computing for CMS physics. And we can’t forget that there is physics to do in here too! I am co-leading a working group at Fermilab’s LHC Physics Center that will be studying physics processes that manifest themselves in final states that include charged leptons, hadronic jets and missing energy. The top quark can fall into this category; it will provide an important calibration point that we need to understand before we can move on to studies of the new physics that we expect to discover with the LHC. “I am an assistant professor of physics at Yale University, and I work on the ATLAS experiment at CERN. I am particularly interested in using the signature of one of the standard model particles, the tau lepton, as a probe for new physics. I am also involved in the “trigger” for the experiment. We will see up to 40,000,000 bunches of protons crossing for collisions every second, and we know that we can only handle keeping a few hundred of them per second for our physics. The trigger is responsible for making the important decision of what we keep vs. what we throw away. It didn’t occur to me to be a physicist until late in high school when one of my teachers suggested it. In college I was a research assistant for a few years working on the Tevatron’s CDF experiment. The top quark had just been discovered when I started college in 1995 and there was (and still is!) lots of excitement in the field of particle physics. I was so hooked on the work, the science and the people that I continued to study particle physics at CDF in graduate school. After graduate school I taught for two years at Roberts Wesleyan College as an assistant professor of physics. I started my postdoc with Stanford’s SLAC National Accelerator Center in 2006, promptly moving to Switzerland to work on ATLAS. I began as an assistant professor at Yale in 2009. I have a real interest in outreach activities that encourage people to study science, especially those who might not initially think of it as an option. In particular, we see a dearth of women and many minority groups in physics. The representation gets worse for these particular groups the higher up you go in the ranks, from students to full professors. It’s difficult for people to catch up who start out with a deficiency in math or science training, so I also have an interest in early science education as well. “I am a graduate student at Stony Brook University, working on the ATLAS experiment and currently residing within eyeshot of CERN in Saint-Genis-Pouilly, France. I’m involved in R&D for the (recently-approved!) IBL upgrade to the pixel detector, with a current focus on 3D Pixels. I’m also working hard on an exotics search for second-generation scalar leptoquarks. One or both of these efforts will find their way into my not-yet-written thesis. I grew up in Grand Rapids, Michigan, and went to undergrad at Kalamazoo College, where I studied Physics, Spanish, and Applied Mathematics. I got into physics by way of consecutive childhood obsessions: dinosaurs -> astronauts -> Star Wars -> computer-generated physics simulations. The jump to the LHC came about naturally. “I’m a graduate student at the Florida Institute of Technology studying high-energy physics (HEP). I take part in the CMS collaboration’s B-Physics Group studying a theory called perturbative Quantum Chromodynamics (pOCD). This theory has had great success at predicting the experimental results seen at the Tevatron and other colliders. Now physicists would like to test it at the Large Hadron Collider. The best way to do this is through studying interactions of massive quark/anti-quark pairs produced in collisions. However, we can’t observe quarks directly, so we investigate their properties by studying bound states of quarks/anti-quarks (called hadrons) or their decay products. I have been interested in science from an early age, thanks to my mother. She would always get me these cool little books on space and physics, and I would spend hours and hours reading them. I became interested in HEP while I was working at Argonne National Laboratory (in physical chemistry, no less). I went with a group of the post-docs to a Pajama Party at Fermi National Accelerator Laboratory for the inauguration of the LHC in 2008. It was there (standing, dressed in pajamas) at 1:30 a.m. that I saw the LHC’s proton-beam halo interact with the walls of the CMS detector. The detector lit up as if it was alive, and I was hooked! It was one of the most awe-inspiring sights I’ve ever seen. I decided to pursue graduate study in HEP. “I am a graduate student at University of Illinois at Chicago. My thesis is based on studying top quark using data recoded with the Compact Muon Solenoid (CMS) experiment at the Large Hadron Collider in Geneva, Switzerland. In particular, I study boosted top pair resonances, which can signal the presence of new particles predicted by new physics models. My parents have a background in physics. This fact predefined my future career and life. I grew up in Protvino in the Moscow region of Russia, seeing science every day. I visited laboratories and even offered to do basic tasks. So, why am I doing physics? I just love it. Later on, I realized that many people do not have clear vision of what the world of physics is like: What are we doing in laboratories? Why is it so important? Blogging is one way to unlock the mystery of science. “I’m a postdoc working on the ATLAS experiment. I’m based full-time at CERN and employed by Southern Methodist University. Although I work for a US institute, I’m actually British and gained my undergraduate degree at Oxford [that’s O.K., Oxford is not exactly chopped liver]. I then studied as a graduate student at Brunel University in London, and from there I moved to California to take part in research at SLAC National Laboratory. After living in the USA for two and a half years, I decided that I loved the way the research was organized there, so working for a US university was a natural next step! I’ve taken part in a range of different experiments, both large and small, including ATLAS, BaBar, CDF and EMMA. I have a particular fondness for “heavy” flavor physics (which is considered light at the LHC), but I bet my interests will change in 2011 as we gather even more data at the highest collider energies the world has ever seen! “I have been a professor at Northwestern University in Evanston, Illinois, since 2000. At the time, I was a member of the CDF collaboration hoping to find the Higgs boson and to do some physics with W and Z bosons. More recently, however, my research is entirely focused on CMS, where I co-lead the Electroweak Physics Group. As a postdoc and one-time CERN Staff member, I analyzed data from the ALEPH experiment, and my Ph.D. from Harvard was granted in 1991 based on an analysis of exclusive rho production in the E665 muon scattering experiment at Fermilab. A couple words more about my physics interests: I have worked in many areas, ranging from non-mainstream QCD topics through B physics and precision electroweak measurements. My main claim to notability comes from my work in SUSY searches, and my long-term interest at CMS lies with new physics searches. This is true, of course, for most physicists at the LHC. “I’m a graduate student at Cornell University’s Laboratory for Elementary Particle Physics working on theoretical particle physics. My work focuses on extensions of the Standard Model and their signatures at the Large Hadron Collider. In particular, I’ve been looking at models of supersymmetry and extra dimensions that can elucidate the nature of electroweak symmetry breaking (why particles have mass) and CP violation (why matter and antimatter are different). I grew up in Los Angeles and have been a California boy through most of my life. I became hooked on physics after reading Lawrence Krauss’ “The Physics of Star Trek,” which probably makes me doubly-geeky. I did my undergraduate studies in physics and mathematics at Stanford University during the heyday of the BaBar B-factory. I then spent two years studying physics in the United Kingdom under a Marshall Scholarship, splitting my time between the Department of Applied Mathematics and Theoretical Physics at Cambridge and the Institute for Particle Physics Phenomenology at Durham University. I’ve since returned to the U.S. to do my Ph.D. at Cornell University. “I was born in 1984 in Kent in the southeast of England. Science and maths were always my favourite subjects, and, fairly predictably given where this biography is being published, physics was the one that interested me the most. I’ve always enjoyed the way experiments deal with matters much smaller and more fundamental than the other sciences, yet at the same time, much larger and of grander scope. My passion for science in general lead me to a rather indecisive choice of degree, physical sciences, at University College London. This was promptly changed to a fully fledged physics masters. Initially, degree level physics failed to recapture the wonder I’d experienced at school; everything was more mathematical and rigid and lacked the exploration and discovery that had first captured my interest. This was until the final two years where two courses really stuck out for me. Rather surprisingly, the first of these was a course in computer programming. This was my first exposure to programming, and I very much enjoyed the building up of trivial problem-solving into something much larger and more capable. The second was a course in particle physics. For the first time, I felt I was studying a cutting-edge field, one where discoveries were still being made. There were pieces missing and new fundamental particles to be found. My master’s dissertation included both programming and particle physics, along with my first exposure to working on a real high-energy physics experiment, ATLAS. I worked on training artificial neural networks, basically pattern recognition tools loosely based on the way neural networks work within our brains, to identify electrons within the ATLAS trigger system. I thoroughly enjoyed this work, and it inspired me to follow this up with PhD studies. I moved university to Royal Holloway, University of London, to study leptonic Supersymmetry and “exotics” searches, still maintaining a trigger theme. Throughout my four years of study I was based partially in the UK and partially at CERN, including an extended period of 16 months which included the infamous 2008 start up. After a successful defense, I recently began a post-doctoral position working for the University of Louisiana Tech, based in Ruston, LA, on a joint grant with Brookhaven National Laboratory in Long Island, New York. I currently work on the development physics analyses of jet production and interpretation of results. So, that is the current group. There are members coming and going, they are always interesting. “Greetings and salutations everybody! I’m gratified and honoured to be the first LHCb US LHC blogger. As well being new to US LHC, I’m also new to the LHCb collaboration, so we can all learn about LHCb and B physics together. LHCb is not a general purpose detector, with the aim of detecting as many different types of physics events as possible; it is especially designed to measure the decays of B mesons (more about why we care specifically about B mesons in a future post). “The Large Hadron Collider (LHC) is a gigantic scientific instrument near Geneva, where it spans the border between Switzerland and France about 100 m underground. It is a particle accelerator used by physicists to study the smallest known particles – the fundamental building blocks of all things. It will revolutionise our understanding, from the minuscule world deep within atoms to the vastness of the Universe.The LHC is operated by CERN, the European Organization for Nuclear Research…. Let’s take a look at the four main experiments at the LHC, ATLAS, ALICE, CMS, and LHCb. The Mainz group aims at using data recorded by the ATLAS detector to resolve fundamental questions such as the nature of dark matter (search for Supersymmetry), the origin of electroweak symmetry breaking (discovery and study of the Higgs boson), and the quest for a unified theory of all interactions (detection of physics beyond the Standard Model). “For the ALICE experiment, the LHC will collide lead ions to recreate the conditions just after the Big Bang under laboratory conditions. The data obtained will allow physicists to study a state of matter known as quark‑gluon plasma, which is believed to have existed soon after the Big Bang. All ordinary matter in today’s Universe is made up of atoms. Each atom contains a nucleus composed of protons and neutrons, surrounded by a cloud of electrons. Protons and neutrons are in turn made of quarks which are bound together by other particles called gluons. This incredibly strong bond means that isolated quarks have never been found. “The CMS (Compact Muon Solenoid) experiment uses a general-purpose detector to investigate a wide range of physics, including the search for the Higgs boson, extra dimensions, and particles that could make up dark matter. Although it has the same scientific goals as the ATLAS experiment, it uses different technical solutions and design of its detector magnet system to achieve these. 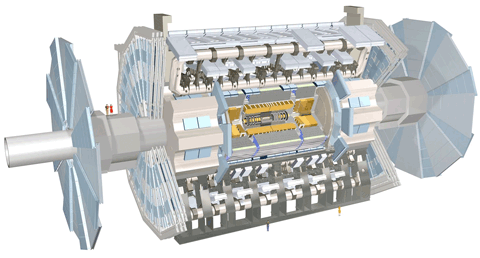 The CMS detector is built around a huge solenoid magnet. This takes the form of a cylindrical coil of superconducting cable that generates a magnetic field of 4 teslas, about 100 000 times that of the Earth. The magnetic field is confined by a steel ‘yoke’ that forms the bulk of the detector’s weight of 12 500 tonnes. 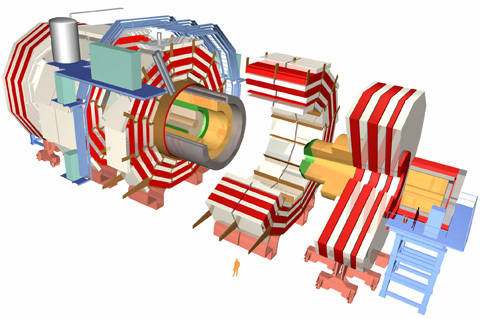 An unusual feature of the CMS detector is that instead of being built in-situ underground, like the other giant detectors of the LHC experiments, it was constructed on the surface, before being lowered underground in 15 sections and reassembled. More than 2000 scientists collaborate in CMS, coming from 155 institutes in 37 countries…. “The LHCb experiment will help us to understand why we live in a Universe that appears to be composed almost entirely of matter, but no antimatter. It specialises in investigating the slight differences between matter and antimatter by studying a type of particle called the ‘beauty quark’, or ‘b quark’.